Are your downstream processes clearly communicated? Do you want to improve them? When manufacturing processes frequently take place in multiple locations, clear communications are key to ensuring the accuracy of the sequential next process. To minimize error, components should be marked before they move on to the next step for easy identification. Typically, this involves some sort of traditional marking. 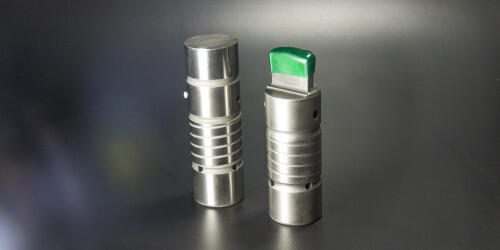 While effective, traditional marking can remove material or damage the piece part. InkMarker™: Write on sheet metal using a special marker that does not dry out for two weeks or more. With InkMarker, the part is not harmed and the mark does not rub off unless required. What’s more, the specially designed marker will not dry out for more than two weeks with the cap removed! Sheetmarker™: Scribe or etch sheet metal surfaces using one of two (120 or 150 degree) diamond inserts for more permanent marking. Film/Tape Cutter: Cut protective film with a brass insert to expose localized areas without damaging the underlying material. Centerpoint Down: Uses a carbide insert in conjunction with machine depth control. High-Speed Dot-Matrix Marking: Perform dot matrix marking using the above carbide insert. Control the depth of downward stroke to vary the marking. Dot-matrix markings may be seen after painting operations. Improved communication would be realized with the use of the visual aids EasyMark creates. Using any one or all of its capabilities could reduce downstream operations and/or paperwork right at the turret. EasyMark can create both permanent (scribe, dot matrix) and non-permanent (marker) markings. Possible reduction in scrap could be achieved through proper identification of components and or steps. Simple process instructions about hardware, bending, painting, etc. Marking all of their bend lines because they don’t rely on the back gauge when they use two people on the press brake. Scribing a line to shear parts down after they go through the press brake so they don’t have to use back up material on the flange. Marks all of parts with lot or job numbers for traceability if the same part is being used on different assembly lines. Used intentionally on powder coated parts because the marker will bleed through the paint, making sure the parts can be indentified when they come off the paint line. Mark lines that help during plasma cutting.